You know when you slip into a pair of shoes SOOOO comfortable you feel like you could marry them? The kind that support you through FOUR WEEKS of trekking through Greece and Turkey to the point that you don't receive even a SINGLE blister, even when they're BRAND NEW? The kind that are so EASY to slip on and off, you leave a pair by EACH door so one pair becomes the slip-ons you run to the video store in, and the other pair becomes the pair you visit the barbecuing maniac that is your HUSBAND in? The kind that just kinda go with EVERYTHING that is summer? Cuz we're soooooo not into the matchy-matchy anymore? Well if you don't, you're missing out. Cuz THESE puppies, THESE shoes, they're your shoes. Well, really, they're MY shoes, but they SHOULD be your shoes. Cuz hot DAMN, they are JUST... THAT... COMFORTABLE. What IS "that" comfortable? It's so comfortable I bought them in both orange AND red. Oh, but if you DO buy them, warn your husband - if it comes down to having to choose between him and the shoes, the shoes just might win. Want easy access to products recommended by Lori and Chicklet? Help support us by visiting the All Thumbs Store, which has no added markup. Just easy shopping, good prices, and thumbs up ratings. I want the Aqua ones. And the trip to Greece/Turkey, too. I am a long-time Merrell fan. Although mine are all closed toe (including my hiking boots). They make the BEST apres ski shoes. Like a warm hug for your feet after the cold plastic of ski boots. 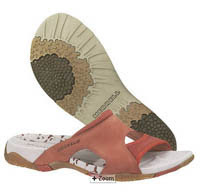 I definitely need to go get some summer Merrells!